Sunlight is just starting to filter through the rainforest canopy as I arrive at the Plaza Mayor, the ceremonial gathering place for the inhabitants of the Mayan city of Tikal, Guatemala. At first only the raucous caws from a passing flock of Red-lored Parrots break the mist-shrouded silence. But soon a Golden-fronted Woodpecker begins pounding out a staccato rhythm on a nearby palm tree. Then the cackle of a Laughing Falcon and the melodious song of blackbirds add rhythm to the woodpecker’s steady beat. The crescendo comes to a peak when a troop of howler monkeys joins in with deep, roaring calls that can be heard for miles. Tikal National Park is to Guate­mala what Yellowstone is to the United States or the Galapagos are to Ecuador. Protected as national park in 1955, it is located within the Mayan Biosphere Reserve that encompasses 3 million acres of rainforest in northern Guatemala. Tikal was once the epicenter of Mayan commerce and trade, and during its peak from 700 to 800 A.D., supported about 70,000 inhabitants. The Mayan Indians built more than 4,000 plazas, temples, and pyramids that largely remain covered by soil and jungle undergrowth. Archaeologists have unearthed and restored some of the major structures, including five enormous temples — tall stone and block pyramids that rise as much as 212 feet above the forest floor. The towering pyramids stretch toward the heavens beyond the highest jungle canopy, providing a mystical view of the area’s rich flora and teeming fauna, and a feel for the mysteries of this ancient culture. While many of Tikal’s visitors come to explore the magnificent ruins and learn about the Mayan civilization, many others come to see the birds and mammals that inhabit the 222-square-mile park. 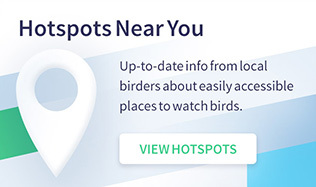 Most birding is concentrated around the visitor center and primary archaeological site, where numerous pathways lead to the ruins and nature trails wind through the dense jungle. 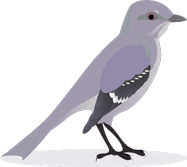 Because the area has enjoyed protection from habitat destruction and hunting, many of the birds and animals are habituated to people and often can be approached quite easily. On the first morning of a recent trip, I walked from my accommodations at the Jungle Lodge past the visitor center toward the Central Acropolis, an architectural complex that is around 2,000 years old. Along the way, I found an iridescent blue-headed male Ocellated Turkey displaying to a nearby female, seemingly oblivious to a street vendor only yards away selling coffee and snacks. Farther down the well-worn path, a troop of two dozen coatimundi foraged in the undergrowth while Brown Jays jumped from branch to branch in the trees overhead. Once inside the archeological area, I spotted a pair of Crested Guan roaming an open courtyard and watched as a small flock of Olive-throated Parakeets stopped to feed for a few minutes before moving on. More than 400 species of birds have been found within Tikal National Park. About 250 are residents, and the others include wintering birds, a few summer visitors, and about 60 accidental species. Tikal’s birds include some of the most accessible populations of Crested Guan, Plain Chachalaca, Ocellated Turkey, Great Curassow, and an exceptional number of parrots and raptors. Tikal’s archeological area and surrounding habitats are within walking distance of the lodging area via well-maintained trails and offer excellent birding. Local guides say that more than 100 species of birds can be seen in a single day in this area. Just past the visitor center is an open area that was once an airstrip. Long abandoned, portions are now a parking lot, but much of it is open grassy area flanked by dense forest. Where the forest meets the open areas, an edge effect is created that is utilized by both forest-dwelling species and those that typically frequent forest openings and clearings. Ocellated Turkey, Red-lored Parrot, Keel-billed Toucan, Roadside Hawk, Social Flycatcher, Brown Jay, Spot-breasted Wren, Groove-billed Ani, Yellow-throated Euphonia, and White-collared Seedeater are some of the species found in this area. Behind the visitor center, a small wetland with dense aquatic vegetation supports a diverse bird community, including Least Grebe, Ringed King­fisher, Cattle Egret, Green Heron, Ruddy Crake, Melodious Blackbird, and the occasional Black-bellied Whistling- Duck. You might even see a Morelet’s crocodile along the shoreline or a green iguana basking near the lake. 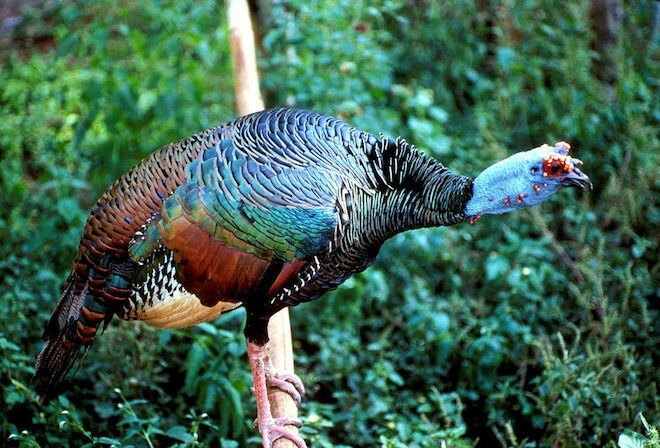 One of the most conspicuous of Tikal’s avian specialties is Ocellated Turkey, a magnificent bird that looks like a cross between a peacock and our Wild Turkey. The species is found only in southeastern Mexico, Belize, and northern Guatemala. During the March and early April breeding season, the males strut their stuff to females, often in the parking lot of the visitor center. Like Wild Turkeys, they display by fanning their tail feathers and strutting. They do not gobble like other turkeys but instead make a slightly nasal, hesitant, pumping puhk-puhk sound accelerating to a long roll. Some have compared it to a motor scooter starting up. Over the past several decades, much of what we know about Ocellated Turkeys has been due to research conducted at Tikal. The park also is well known for its diversity of raptors. One evening, I climbed to the top of one of the temples to watch the sunset. Even before I could catch my breath, a Bat Falcon dashed across an open courtyard and landed on the edge of a pyramid. Within seconds, its mate joined it. 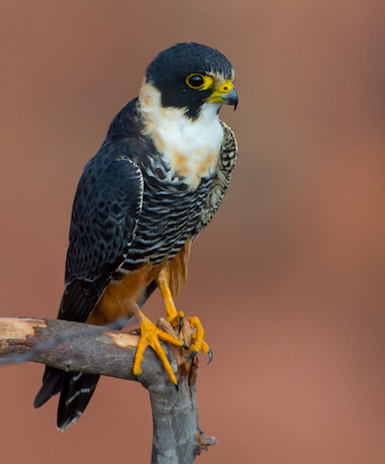 Bat Falcons are small, dark, compact raptors with a white throat. They are among the fastest birds in the world, capable of flying 70 mph in level flight and more than 100 mph in a dive. They are relatively common in Tikal and are found in rainforests throughout much of Mexico and Central America south to northern Argentina. They feed on bats, small birds, and insects. The larger and rare Orange-breasted Falcon also is an inhabitant of Tikal. It occurs in the same rainforest habitat and has a similar range — from Mexico to Argentina. Birds are its primary prey. Another regional specialty found here year-round is King Vulture. Not too far from the visitor center, I looked up and spotted a kettle of Black and Turkey Vultures soaring overhead; since they were common and familiar species, I moved on. As I continued along one of the trails leading to the archeological area, I passed a small clearing in the otherwise-dense jungle. Suddenly several large birds flew from the forest floor to the nearby trees. By accident I had flushed Black and Turkey Vultures, along with a single King Vulture, from a partially consumed white-tailed deer carcass. The King Vulture is a spectacular bird, similar in size to a Turkey Vulture. While its black and white plumage is distinctive, the naked gray, orange, and red head of adult birds is the most unique. Full adult plumage is not attained until the fifth or sixth year. The bird that flew from the carcass was a magnificent adult. I watched for a few minutes from a safe distance and then moved on. The variety of bird life in Tikal’s pristine rainforest is astounding. Early one morning, I climbed to the top of Temple IV, the tallest Mayan structure, to greet the new day and look for upper-canopy species. It wasn’t long before I spotted a Bicolored Hawk sitting atop a dead tree, where it likely roosted the previous night. Seconds later, a pair of Short-billed Pigeons jumped from branch to branch, and a single pigeon flew across an open courtyard, giving me an excellent look. I also observed a White-necked Jacobin and a pair of White-bellied Emeralds at close range. If you get to the high vantage point, watch for Blue-crowned Motmot, Plain Xenops, and the somewhat rare Yellow-backed Oriole. While walking the trails, not only are you likely to see raptors and forest species, but you also may come upon birds feeding on ant swarms. 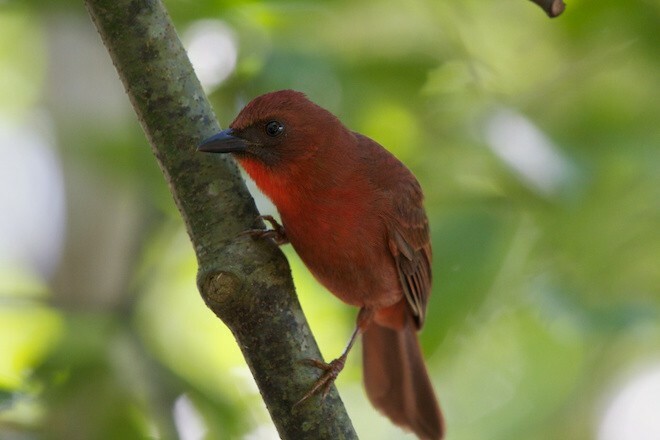 The interesting behavior often draws mixed flocks that could include Red-throated Ant-Tanager, Black-throated Shrike-Tanager, Gray-headed Tanager, Olive-backed Euphonia, and Olivaceous, Ruddy, and Northern Barred Woodcreepers. 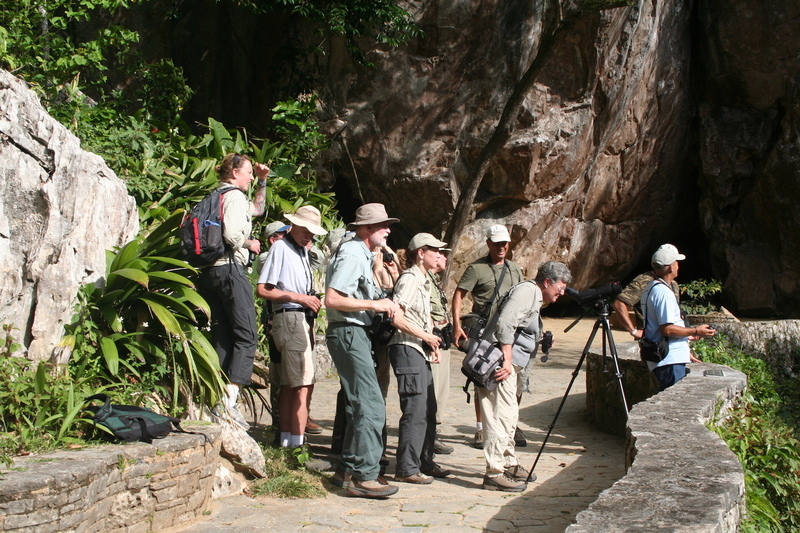 North American birders who visit Tikal will find familiar birds as well as the exotic locals. Central America in general and northeast Guatemala in particular are important for wintering Neotropical birds, and they provide habitat for migrants that continue flying to more southerly wintering grounds. 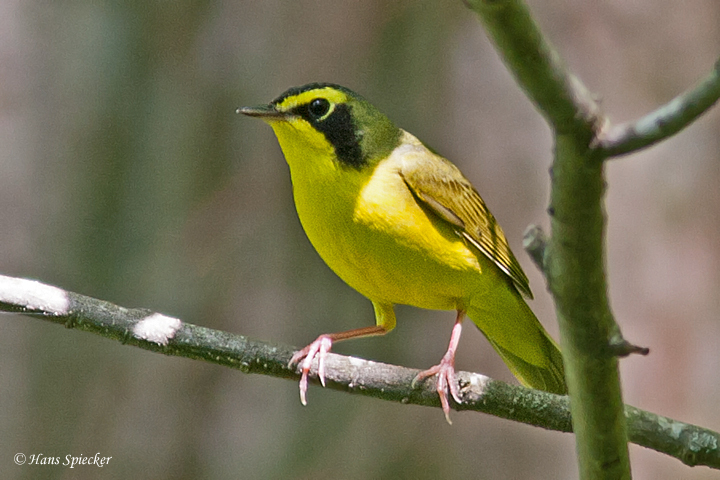 Beginning in October and extending until April, you might see as many as 35 wood-warblers in the Tikal region. They include Tennessee, Yellow, Magnolia, Blue-winged, Chestnut-sided, Yellow-rumped, and Black-and-white Warblers. Other relatively common migrants and winter visitors include Wood Thrush, Gray Catbird, Indigo and Painted Buntings, and Summer Tanager. At any season, look for the resident Gray-crowned Yellowthroat and Golden-crowned Warbler. While Tikal is a fantastic location to see birds, it is also home to a variety of mammals, and some are quite tame and approachable. The most conspicuous are coatimundi. Seldom does a morning or afternoon stroll on a nature trail pass by without coming across a troop of the animals, ranging from four or five individuals to as many as 30. Resembling a long-snouted and long-tailed raccoon, the omnivores comb the forest floor and the canopy looking for ripe fruits and insects. The rainforest harbors both spider and howler monkeys while the forest floor is home to agoutis and pacas, rodents about the size of large rabbits. Also present but less frequently seen are white-tailed deer and gray fox along with several mostly nocturnal and elusive cats, including margay, ocelot, jaguarondi, and jaguar. Tikal is without question one of Central America’s crown jewels when it comes to birdwatching. Walking down lush green pathways with ferns, bromeliads, and orchids hanging from towering trees while watching toucans with their huge, brightly colored bills forage in the branches overhead and spotting a pair of Great Curassows on the forest floor are images that will be etched into my memory forever. 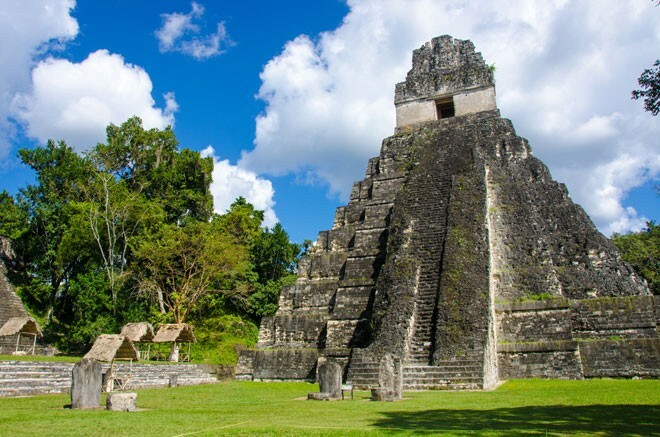 So if you are in the mood for pristine tropical rainforests, excellent birding, and immersion into ancient Mayan culture, look no further than a trip to Tikal National Park. You won’t be disappointed! Guatemala is often called the travel bargain of the Americas. The country is easily accessible, spectacularly beautiful, friendly, safe, intriguing, and relatively inexpensive. What makes Guatemala unique is no single ingredient but the sum of its many parts. 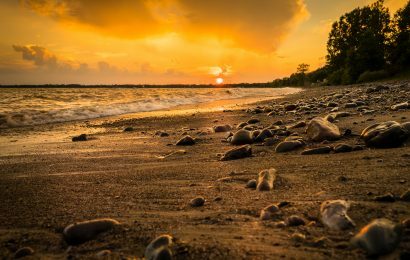 From the black sand beaches of the Pacific to the frigid peaks of 30 volcanos, from cactus-studded deserts to tropical rainforests, Guatemala is one of the most ecologically diverse countries in the world. Getting there: Several major airlines serve Guatemala City from Dallas, Miami, Houston, and Los Angeles. From Guatemala City, Avianca and TAG Airlines operate daily flights to Flores. Tikal is 37 miles from the Flores airport. Some lodges provide shuttles to the park, or ground transportation can be arranged at the airport. Where to stay: You’ll find a variety of accommodations in Flores and nearby Santa Elena. However, to be in the park at first light when the birds are most active, it makes sense to stay in the park. It has three lodges — the Jungle Lodge, Jaguar Inn, and Tikal Inn. They all have restaurants and are clean and comfortable. The lodges can be booked direct or on Expedia, Orbitz, and other web-based booking services. Or book lodges, ground transportation, local flights, and birding tours with Ecotourism & Adventure Specialists. Weather: The climate of Guatemala is fairly uniform throughout the year. The amount of precipitation defines the seasons: rainy from May to November, often with showers in the afternoons, and dry November through April. 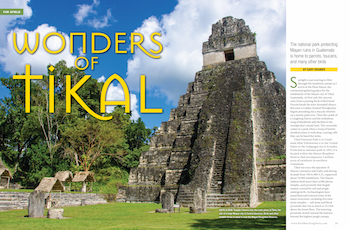 The Tikal region is hot and humid; daytime temperatures reach the 80s and 90s, cooling to the 60s and 70s at night. Dress for warm humid weather, use plenty of sunscreen, and bring bug spray. For a complete guide to Guatemala, go to www.visitguatemala.com. Gary Kramer is an outdoor writer and photographer based in Willows, California. For 26 years, he was a waterfowl biologist and refuge manager with the U.S. Fish and Wildlife Service. His books include Game Birds: A Celebration of North American Upland Birds and Flyways: A Celebration of Waterfowl and Wetlands. 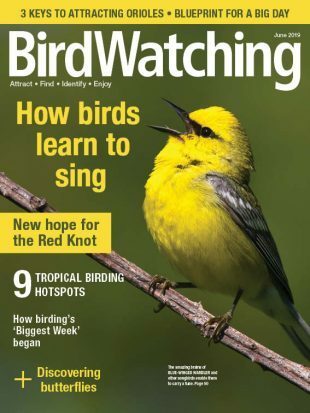 In past issues, he has written for us about birding in Churchill, Manitoba, and Yellowstone National Park. Writer and photographer Jerry Uhlman shares spring hotspots along Canada’s Riviera.